Bryant Park Blog: Birding Guide Asks: Too Much Technology? Birding Guide Asks: Too Much Technology? Fall migration is in full swing, and birds are heading southward by the thousands. On this morning's Bird Walk in Bryant Park, we spotted 17 species, and over 25 species of birds were reported from the park this morning by various observers. That's pretty good for such a small slice of habitat, and represents nearly 25% of all the bird species ever recorded in the park, just in one morning! It was a particularly productive morning for observing birds because in addition to being the apex of fall migration, weather conditions were conducive to southward movement. Last night we had winds from the northwest, which is exactly what birds wait for to help propel them toward their southerly destinations. No sense fighting a headwind. Most songbirds migrate overnight, for several possible reasons. It may be in part because the winds are steadier at night; it may be to avoid predators; and it may be because they use the stars to help them navigate (or some combination of these factors). This rare Mourning Warbler was spotted in the park. The Birding Tour missed the sighting by mere minutes! When conditions are favorable as they were last night, birds fly in such large aggregations that their flocks can be seen on weather radar (as I've examined in the past). Bird watchers eagerly check the weather and the radar to determine when it will be a good morning to be out early, as the birds alight exhausted and hungry; this was just such a morning. Of course, people have watched the skies for millennia, and ancient sailors and farmers may have had intuition and understanding about the weather that would match our own frequently fallible modern meteorologists. But technology does help. Bird watchers, as you might expect, use other technology at their disposal to locate birds and disseminate word of rare sightings. Fittingly, many bird watchers are active on Twitter (you can follow me @GabrielWillow). There are also listservs, SMS Rare Bird Alerts, and more. I don't tend to chase rare birds. For me, watching birds is just a part of close observation of the natural environment. With my background in ecology and conservation biology, birds are particularly fascinating to me as bellwethers of ecological change, and also as dynamic ambassadors that draw people into caring about the natural world. I love exploring the urban environment and seeing birds surviving and even thriving in the unlikeliest of places (including a certain midtown park). I get just about as much satisfaction from seeing my 1,000th American Robin yanking worms out of a park lawn as I do from spotting some rarity. That being said, there is a certain thrill to seeing something you know is unusual for an area, to say nothing of the frisson of seeing a species for the first time. I had just such an experience this week, seeing a bird I had long hoped to observe: a little arctic songbird with the odd name of the Northern Wheatear. One got perhaps a bit lost en route from Greenland to its wintering grounds in sub-Saharan Africa, and turned up at Plumb Beach, Brooklyn. I probably wouldn't have known about it if it weren't for an NYC birding email list, or various posts I saw on Facebook. Earlier this week I had a free afternoon, so I took the B train the end of the line, to a bus (it was a long commute, but it beat travelling to Greenland! ), and then jogged along the beach for a mile or so, until I spotted a telltale cluster of people with binoculars and cameras, and there it was, a handsome little russet bird with a black-and-white tail and jaunty upright bearing, perched on a goldenrod shrub. I watched it for a few minutes and then began the reverse trek back home; I had a tour to lead. Sometimes technology can hinder more than it helps however; several studies have indicated that Facebook and other social media technologies make people less happy and satisfied in their lives. Bird watchers too can fall prey to this phenomenon. During last week's Bryant Park bird walk, I was happily leading a group of about 18 participants around the park, sidestepping the turf that was getting torn up for the installation of the seasonal market and skating rink. We spotted a good variety of birds, including an astonishing 25 Yellow-bellied Sapsuckers (a real bird, although it sounds like an insult; it's a type of migratory woodpecker). 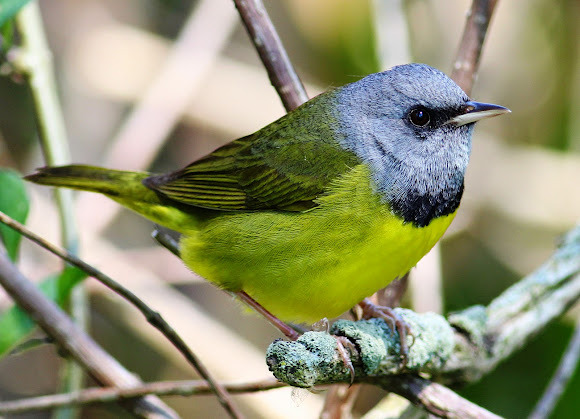 While we were straining to identify some treetop warblers in front of the library, I received an email on my smartphone alerting me to the fact that a reputable birder had just spotted a rare Mourning Warbler in Bryant Park! Wait, where? How had we missed each other? I excitedly told the group and we speed-walked over to Southwest Porch, the location of the sighting. However, neither the birder nor the bird were anywhere to be found, in spite of the fact that the email had been sent less than ten minutes prior. We scoured the area for close to an hour. I was determined to find this warbler. It was just not right that a rarity would pop up in the park, to be casually found by another bird watcher on his way to work, at the very moment my weekly walk was on the opposite side of the park. Other birders steadily gathered, having received the same alert as me. We fanned out. We scanned the ivy and bushes. No Mourning Warbler. This species is famous for its skulking behavior (in fact, it's probably more common than it seems; it's just very hard to spot), so it was entirely probable that the bird was hunkered down in the ivy somewhere, avoiding all the attention. It was never spotted again, to my knowledge. The bird enthusiasts slowly drifted off to their various offices and other responsibilities, left with a familiar sensation in our over-connected age: FOMO.